A great example of a compensatory strain and a common source of chronic pain and lameness is the iliopsoas muscle. Iliopsoas muscle tears are a relatively common yet infrequently diagnosed injury in dogs. Tearing of this muscle is very painful and causes pain and lameness. Commonly, exercise exacerbates the lameness with this condition. Pain is noted when stretching the affected muscle, either by putting the hip in extension with abduction or by putting the hip in extension with internal rotation. The psoas major and iliacus muscle groups combine to form a band of muscle (the iliopsoas)originating along each side of the lumbar spine and inserting on the inside portion of each femur (we would call this a groin muscle). A dog would use these muscles to flex the hip and lower portion of the spine, for lateral rotation of the thigh, and to advance the femur forward. Iliopsoas strain (tear) results from excessive stretching of this muscle during highly athletic activities such as agility training or fetching a tennis ball. The injury occurs commonly at or near the muscle-tendon junction, the weak link. Slipping into a splay-legged position, jumping off an elevated surface, excessive training or play, and roughhousing with other pets are common causes of the muscle strain. Shifting off of a painful limb changes how a dog or cat moves and maintains their body weight. This puts an aggravating stress and strain on compensating joints and muscle groups. During a period of play, a dog may twist the wrong way and partially tear a cruciate ligament. They then begin to shift their weight to the opposite hind leg, tuck their pelvis, or shift weight primarily to the front limbs to avoid painful movement. That works great initially until the joint and muscles of the other limbs protest and begin to spasm. Canines who participate in activities or sports that involve a lot of jumping or movements with great hip extension can aggravate the iliopsoas resulting in knocked bars, shortened jumps, and a skipping gait. What kind of activities would that be? Dock Diving, Agility, Fly Ball, Lure Coursing, regular frisbee and ball play. We will also see iliopsoas stain and pain as a secondary issue in our patients with orthopedic changes such as hip dysplasia, arthritic hind end joints, disk disease/back injury, and recovering post-op orthopedic repair (to name a few). 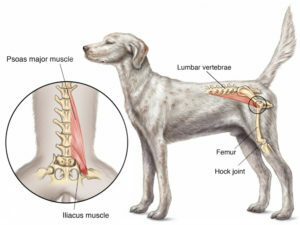 Things that a veterinarian may look for in a pet when evaluating for this type of condition would be hind limb lameness that gets worse with exercise, a skipping or shortened stride in the back legs, pain with palpation of the iliopsoas insertion, and pain with hip extension and simultaneous rotation. An acute iliopsoas strain may respond to 6-8 weeks of rest, a course of NSAIDs +/- muscle relaxers, laser therapy, and massage/heat therapy to loosen the tight and painful muscles. In cases of chronic iliopsoas strain (or a mix of both acute and chronic), most patients won’t respond to the acute protocol and need a different approach to find healing and effective pain control. So what are the options for the more chronic conditions? Radiographs (X-rays) frequently do not show the muscle tear in the acute phase; however, in chronic cases the torn muscle may have mineralized densities. Ultrasound is a good tool to help diagnose this problem, but sometimes the muscle may only have microscopic changes that may not be seen on ultrasound imaging. MRI and CT scan are other diagnostic tools that can help in the diagnosis of the problem. Commonly, the diagnosis is based on the clinical findings during the examination. 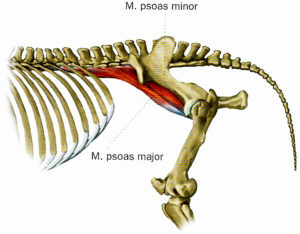 The iliopsoas muscle consists of the fusion of the iliacus and psoas major muscles. 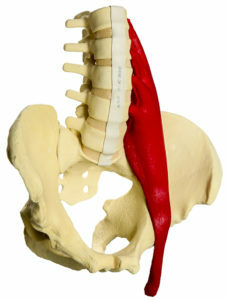 The psoas muscle attaches along the underside of the backbones, and the iliacus attaches on the inner side of the pelvis. These two muscles join together and form a common tendon that attaches onto the lesser trochanter of the thigh bone (femur). The function of this muscle is to externally rotate and flex the hip joint. Animals can function without this muscle. Surgery is indicated for those dogs that fail to respond to medical treatment or have frequent recurrences. Surgical cutting of the tendon from the femur should not be performed unless the diagnosis has been confirmed with ultrasound imaging, CT scan or MRI. Outcome with surgery is good to excellent; however, working dogs likely will only be able to work at a reduced level to prevent additional injury to other muscles around the hip. In cases where there is irreversible change to the tendon, such as brosis (excess connective tissue) where the muscle and tendon meet, surgically releasing (cutting the tendon from the bone) may be needed. Acupuncture therapy can help manage and improve this soft tissue condition. The acupuncture needles, placed in strategic locations, will release stagnation and create an inflammatory response that is vital to the healing process in chronic conditions. The frequency and duration of acupuncture depends on the patient’s symptoms and response to treatment. The average pet generally receives an acupuncture session once weekly for 2-4 weeks and then assess progress and decide on future therapy. Heat therapy combined with massage is another important modality to help bring circulation to the area, release tension, and provide pain control. Pet owners will place a warm gel pack along the lower spine and along the inside muscles from hip to hock for 15-30 minutes twice daily to start. Heat would then be followed by gentle massage along both sides of the lumbar spine and down the hind limbs (inside and outside muscles). After some heat and a relaxing massage, applying a light stretch to all of the warmed up hind limb muscles and joints (from toes to hip) would be a great way to end a session. Gentle flexion and extension, held for 10-15 seconds, has it’s greatest benefits when applied to limbs that have been warmed up through easy exercise or manual stimulation. Rehabilitation therapy, conducted by a trained professional, is a very important treatment modality and includes laser therapy to improve the circulation to the muscle and hasten the healing process. Passive range of motion (not too excessive so that it is not painful) helps to maintain flexibility of the muscle. Overstretching can further tear the muscle and delay healing. Interferential e-stimulation, exercises and progressively increasing the weight bearing of the affected limb are beneficial. After a few weeks, active range of motion exercises to strengthen the muscles is added to the rehabilitation program. Exercises that strengthen the muscles include cavaletti pole stepping; para standing, which involves lifting the front and hind limbs on the unaffected side; placing the paws on an elevated surface; and wobble board exercises. Chronic strains should not be treated with nonsteroidal anti-inflammatories, as this will prevent activation of the inflammatory process that is needed to reinitiate the healing process. Rehabilitation therapy by a professional is essential. Rehabilitation for chronic strains may include heat therapy, deep penetrating ultrasound, cold laser therapy, and massage. Unlike acute tears, chronic tears are treated with stretching and exercise. Recovery from chronic iliopsoas strain takes months. If your companion is an agility dog, weave poles, tight turns and high jumps should be avoided during the early reconditioning period. To prevent re-injury to the iliopsoas muscle, pre-exercise stretching of the muscle should be done. Extension and abduction of the hip is an excellent stretching exercise for the iliopsoas muscle. In fact, stretching of all muscles is a very good idea for any canine athlete. Before strenuous activity is initiated, low jumps and wide turns should be done. Stretching with no warm up can be harmful to the muscles and performance of the dog during agility. If time is limited prior to an agility run, a low impact exercise is more important than stretching. After training or agility performance, cool down exercises are important followed by application of an ice pack to the groin for 5 minutes on, 5 minutes off, and then 5 minutes on. When the pain is controlled and the lameness has resolved, it is time to evaluate for environmental triggers and sources of future strains that may start the cycle of strain all over again. Many of the canine athletes and dogs that play fast and hard will need to have their activities controlled. 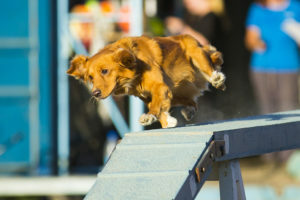 A lot of the older competitive dogs may be sound as an average pet but will not be able to return to their sport of choice due to risk of re-injury. Controlled activity is important as well as avoiding triggers such as running, jumping, and splaying of legs. This means no ball playing, rabbit chasing, jumping off the deck, or rough play. Swimming, while a great conditioning tool, can actually aggravate iliopsoas pain. Leashed walking on land or in the underwater treadmill at a slow to moderate pace would be a better exercise choice. Slipping on hard wood or tile floors is a common source of iliopsoas injury (especially in the older pet) and can be avoided by providing runner rugs or using booties for traction. In the case of dog with concurrent arthritic disease or orthopedic change, the trigger for an iliopsoas flair up is not going to go away. These patients are managed long term with a variety of options such as oral pain control, regular laser and/or acupuncture therapy, and strengthening exercises such as aqua therapy or targeted core work. The frequency of long term therapy can be every 4-6 weeks for a “tune up” or more often if needed. Don’t think that your dog or cat needs to live with chronic muscle pain. There are a variety of treatment options available at the Animal Clinic of Billings and Animal Surgery Clinic that can bring relief and healing. If you are concerned about your pet or think that they need to be evaluated for therapy, please call us to schedule an appointment with one of our veterinarians. Contact us today to see what would best fit the needs of your canine companion: medication, acupuncture, rehabilitation, or a combination of all of the above.